I'm very excited about the mods I have for you today. One of the reasons many of us think Sims 2 is such a great game, is the attention to detail in the coding. The personality-based behaviors and little quirks that you might discover after playing the game for many years make this game stand out. There's always something we haven't seen yet. Among these great things, are hidden interactions that Sims may perform autonomously but that the player can't see or direct them to do. I think that's a shame, because it means a lot of players might not get to see them and they only show up rarely which means you don't get to enjoy them as much. While you can unhide them by the use of a cheat, it's not the safest thing to do and it unhides all hidden menu options, not just the ones you want. As a safer and more player-friendly alternative, I have created three global mods that unlock some of these great interactions. The interactions included are snooze, window washing, and sliding on banisters. Sliding on banisters is a M&G interaction and requires M&G, the other two are from base-game. Because each one is a separate mod, this thread contains a lot of information. To make it a bit less visually overwhelming, I will hide each mod-description under spoiler tags. Be sure you read through it all to know what you are getting though! I'm very proud of these, as they are the most complicated things I've done so far. I couldn't have done it without BoilingOil though, so if you like this creation make sure you send a thankful thought to him for all his help. Perhaps go check out his creations? This is a set of three global mods that unlock hidden interactions that are normally only performed autonomously. They allow you to see the interaction in pie menu (see more exact details under each mod) and direct your Sim to perform them. The snooze interaction is a hidden interaction on armchairs and sectional sofas. It differs from the nap-interaction of regular sofas and recliners. 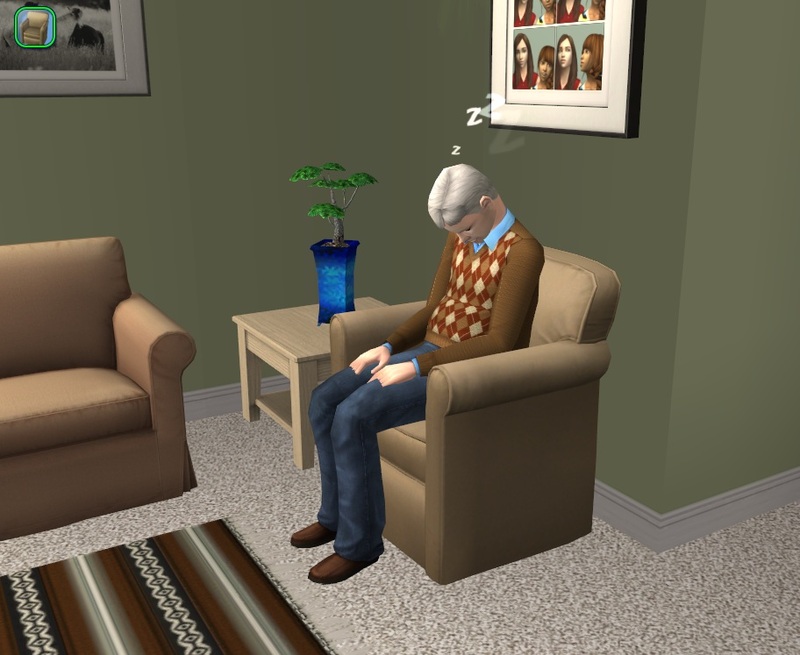 The Sim falls asleep while sitting up, dropping it's head towards it's chest. I love having my elders fall asleep in front of the TV with this interaction, it's adorable! This interaction is available on armchairs and sectional sofas. It can be used by teens, young adults, adults and elders. This mod comes in four different flavors. I know that sounds like a lot, but there is a reason for it. In the original code, snooze is only available on armchairs a Sim is already sitting in. However, the code for the interaction can handle it even if the Sim isn't sitting down yet. I personally like the option only being available when a Sim is sitting in an armchair, but if someone wants to line up a bunch of interactions they might not want to wait until the Sim is sitting to select it. I decided to offer both options, and let each person decide for themselves what they prefer. Each of these two then comes in a residential only and a community lot enabled version. Numenor's sleep on community lots does not include snooze interaction, and to me, snooze is the most logical sleeping interaction for a community lot. How many of us go about lying down on public sofas for a nap, as opposed to falling asleep while sitting down on a train or something? 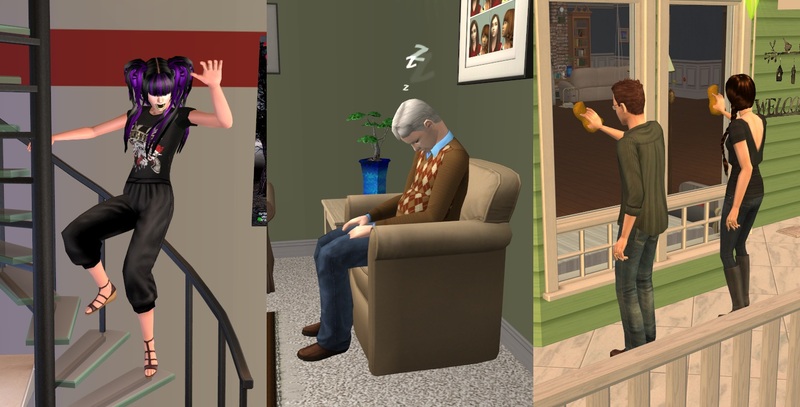 I wanted my Sims to be able to snooze on community lots, but not everyone wants sleeping on community lots, so I decided to offer both versions. Do you want the snooze interaction to be available at all times? Known problem with this version: If a Sim is sitting in a sectional sofa, and you select snooze on a different section of the sectional sofa than the Sim is sitting in, the Sim will jump to that section before snoozing. Harmless, but looks weird. Does not happen with armchairs, only sectional sofas. Do you want snooze only to appear on chairs a Sim is sitting in? Only use one of them. Compatible will all EPs/SPs. Interaction came from BG, so no EPs are required. Works with custom armchairs and sectional sofas, as long as the creator did not remove the interaction from pie menu. Conflicts with Cyjon's Less Napping. If you make mine load after Cyjons, it'll keep Cyjons changes for the other types of napping, but overwrite the snooze part with my enabled version. This means his changes to reduce frequency of snoozing are overwritten as well, so you'll have to decide if you think it's worth it any way. No others that I know of. Let me know if you encounter any problems. Window washing is an interaction that Sims with neatness of 7 or above could do autonomously. They pull out a sponge and scrub the window. If they can reach, they scrub both the inside and the outside of the window. The interaction is available for teens, young adults, adults and elders. While we can't actually see it, windows have a dirty state. The washing interaction is only available on windows that are dirty, so new windows or windows that were just cleaned won't have the interaction. The window's cleanliness decays daily, at what seems to be a random time of day. One day is enough for the interaction to reappear. If you can't see the interaction, that probably means your windows aren't dirty yet and you need to wait a while. The code for this interaction requires the Sim to be in the same room as the window. If you select the interaction when a Sim is in a different room, the interaction will simply fall out of queue. This is not because of the code in this mod, but the interaction itself. I might try to fix that one day, but for now we'll have to make sure our Sims are in the same room as the windows they want to wash before we direct them to do it. This mod comes in two flavors. Only use one. Enabled For All: This version enables window washing for all Sims, regardless of personality. Only Sims with neatness 7 or above will autonomously clean windows, but you can direct any Sim to do it. Only Neat: This version only enables the interaction for Sims with neatness 7 or above. You can direct your Sims to wash windows, but the option only appears if the Sim you are trying to direct is neat enough. These Sims can also autonomously clean windows, just as before. Works with custom windows, as long as the creator did not mess with the pie menu. No other mods that I am aware of. If you encounter any problems, let me know. Are you sure the windows are dirty? The interaction only appears on windows that are considered dirty by the game. See the information above for more details. If you are sure your windows are dirty, are you using the Only Neat version? If you do, does your Sim have enough neat points for the interaction to be available? The interaction just falls out of queue and nothing happens! Your Sim must be in the same room as the window for this interaction to work. That's how it was coded by EA, and this mod does not change the interaction itself, it only enables it. Tell your Sim to walk to the room with the windows, and then direct your Sim to wash them. 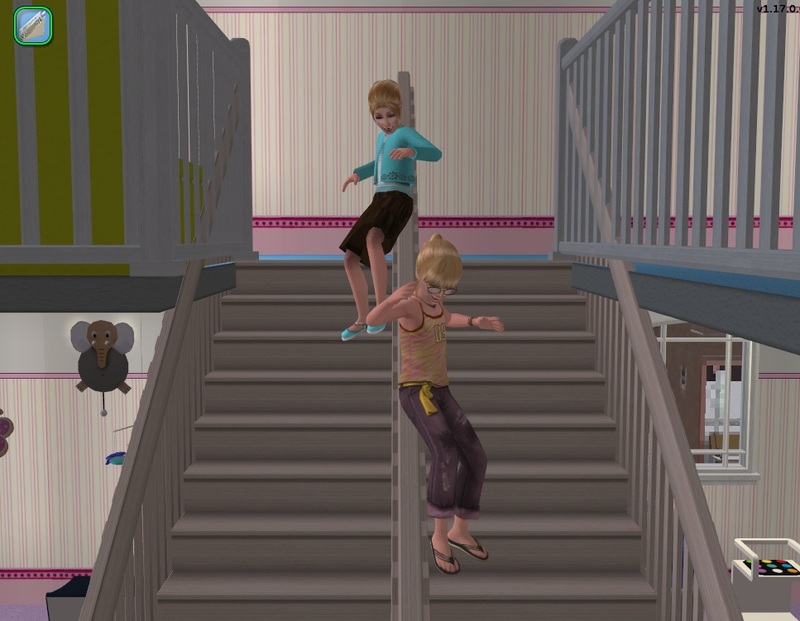 With M&G, playful sims could now skip walking down the stairs and instead slide down on the banister. The interaction is available for Sims with a playfulness of 7,5 or higher. 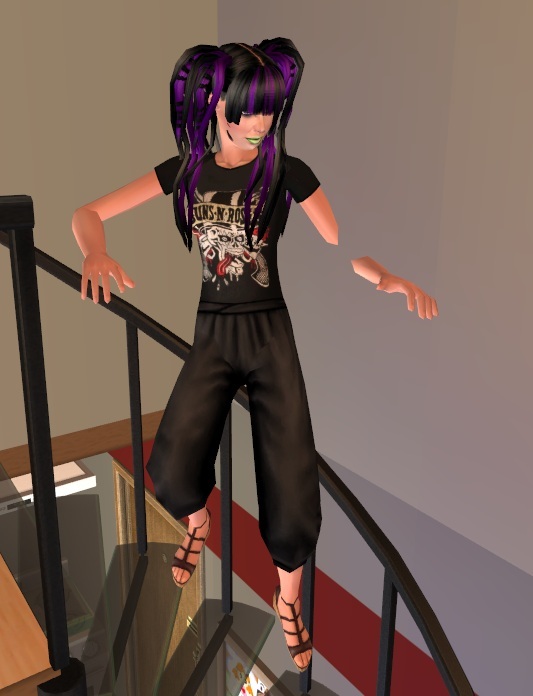 If your Sim visually appears to have 7 in playful, it may or may not be able to autonomously slide down banisters depending on what it's exact value is. This interaction is only available for children and teens. Spiral staircases, and the set straight staircases with railings have this interaction. Modular stairs do unfortunately not have this interaction. It works even if the stair is next to a wall, but there may be some clipping where the Sims arms go through the wall. Enabled For All: This version enables sliding down banisters for all Sims, regardless of personality. Only Sims with playfulness 7,5 or above will autonomously slide down, but you can direct any Sim to do it. Only For Playful: This version only enables the interaction for Sims with with playfulness 7,5 or above. You can direct your Sims to slide down, but the option only appears if the Sim you are trying to direct is playful enough. These Sims can also autonomously slide down, just as before. Requires Mansion & Gardens. Compatible will all EPs/SPs, but requires M&G to work. Works with custom stairs, as long as the creator did not mess with the pie menu. Rebecah's mods allowing toddlers, puppies and kittens to use stairs have not been updated for M&G, and the slide interaction is missing from the pie menu of straight set stairs when you have that mod. My mod does not conflict with Rebecah's mod, but it can't enable something that isn't there. Fortunately it's easily fixed by updating the pie menu in her mod, and thanks to Rebecah's generous policy I am able to share that fix with you guys. If you use one of her mods and you want Sims to be able to slide down, you need to download the M&G updated versions. You can find these in the first comment of this upload, or in the comment-section of the original mods. For more information about Rebecah's mods, see the toddler only version here and the toddler, puppies and kitten version here. After uploading this I discovered that Squinge had already made a mod that enables this interaction. My version conflicts with his. You can find Squinges version here. He took it a step further and included animations for adults and elders, so if you'd like all age groups to be able to slide down stairs you should go take a look at his version. His version is the equivalent of my EnabledForAll. It enables it for all Sims when you direct it, but only playful Sims can autonomously slide. It does not say so in the thread, but Squinges version will conflict with Rebecah's toddler enabled stairs. You'll have to decide if you want Squinges or Rebecah's, you can't use both. No other conflicts that I know of. If you encounter any problems, let me know. Want them enabled but not autonomous? It didn't occur to me when making this that someone might not want them to be autonomous, because they never happen autonomously in my game. Because there are already 8 mods in this, I don't want to go around making no autonomy versions and make it even more confusing to pick. However, if anyone would like one of these with the autonomy disabled, you are very welcome to request it and I'll make it for you. A big massive thank you to BoilingOil for all his help on this project. Without him this probably wouldn't have been finished, and it would certainly not have come out as nicely as it did. I'm very grateful to have someone I can ask questions when I get stuck, with enough patience to deal with me If you would like to check out his many great creations, you can find them at Leefish. A thank you to Phaenoh who reminded me that window washing exists. I had totally forgotten about it and might have forgotten to include it had she not mentioned it. Our conversations also got me thinking about autonomy, and reminded me that I needed to make sure the autonomy of these interactions was preserved. Purple dreads worn by Amy sliding down spiral stair is by Nouk, found here. Amy is wearing Roman Ninja pants by CatOfEvilGenius, found here. Brown braid worn by Emma washing windows, is also by Nouk, found here.